Photo Etching or photochemical machining is a fast and cost-effective alternative to traditional tooling methods and can be one of the most inexpensive processes for manufacturing short-run metal parts. In the photo etching process, film is generally used to expose metal to light and is not subject to the same type of wear as traditional stamping and punching dies. Since the cost of tooling is much less expensive, photo chemical etching is a more cost–effective method for producing short-run jobs such as prototypes. Unlike many traditional production methods, most photo etching tools can be produced in hours—not days. Some parts are so complex and fragile, like semiconductor leadframes, they can only be produced by photo etching. Newcut has forty years of experience working with parts of all levels of complexity; our staff can advise you if photo etching is suitable for your project. In photo chemical etching the unit of labor is the sheet. The more parts that can be produced per sheet, the lower the unit labor cost per part. 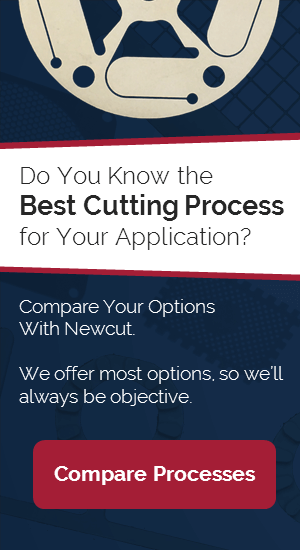 Newcut engineers will specify the largest sheet size possible consistent with the size and dimensional tolerances of your part. Material thickness affects costs. The thicker the metal, the longer the length of time to etch through. If your project requires precision machining, you should consider photo chemical etching. As the geometry of the part becomes more complex, photochemical machining results in greater economic advantage over other processes such as CNC punching or laser cutting.